Munich is a nice place to be and the early summer is probably the best time to visit the city. The sun is shining but the air is fresh and it is a perfect climate to visit one of the parks, or better, one of the Biergärten (Beergarden). But people came here to talk about LASERS (at least until 4pm) and literally, there was really much to talk about. 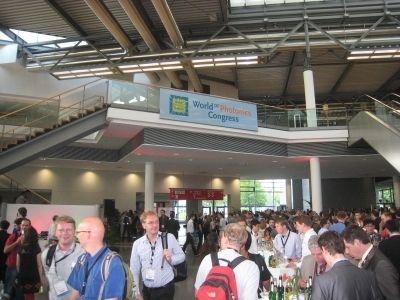 The World of Photonics Congress with its many sub conferences started on Sunday already. Over the week there are not less than 9 conferences within the congress and the trade show organizers added a comprehensive supporting program with excellent speakers in the trade show area. So one has to plan carefully to see at least a major part of the huge program. And still, there are more than 1.000 exhibitors (the booth plan names even more than 1.200) showing their latest innovations. Therefore the title biggest photonics event f the world seems well deserved. And with an extension over 4 halls here at the Munich fair ground, it is the biggest LASER that I can remember. I expect that the visitor number will reach a new record. My personal schedule was already smashed in the morning when Lufthansa canceled my flight from Berlin. Therefore I missed not only the plenary talks at the congress in the morning but also the 11 am round table talk on the „German way in the global race for Photonics“. With a bit of jogging through the halls I was just in time to attend the Fraunhofer press tour. And that was quite interesting. First it was surprising to see a large crowd of press people there, this seems to be a new record, too. 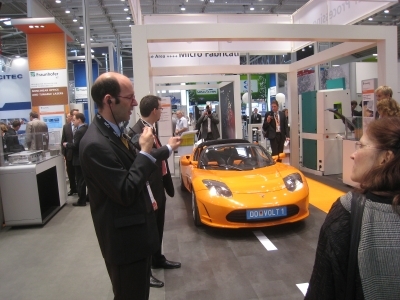 Then there were a number of exciting innovations on the Fraunhofer booths. One thing was their ultrafast laser system. This year, femtosecond lasers for industrial use are a very hot topic. I remember that Fraunhofer ILT presented a first prototype of their INNOSLAB based system already at LASER 2009 and now they present an upgraded system that holds several world records, namely the one with 1.1 kW average power. Just recently they added the record for the highest green average power of 600 W.
A real eye catcher on their second booth is a TESLA roadster. The electric vehicle was driven to the trade show from Austria, and apparently the 450 kg battery pack allows to drive a remarkable distance. The Fraunhofer institute has two issues with the car: E mobility and light weight (composite) materials. For the e mobility they specialize in welding and micro structuring of battery parts. Their contribution to the processing of light weight material seems even more exciting: They intend to develop full process technology for the automated cutting of carbon fiber materials. This will be a nice application of short pulse lasers. So far my first impression from the trade show. There were many many more thing to report about. I would like to mention the colleagues from optics.org, who made a report on the session on ultrashort lasers for industrial use already on their website. Last but not least: the LASER is always aplace for nice parties. Th ere were several smaller events on the booths or in the meeting rooms adjacent to the trade show. The biggest one was certainly the official reception of the congress, where probably more than 1.000 people met for a nice gathering. I don’t know when this event came to its end, but in the beergardens of Munich we saw many of the Laser folks later in the evening and I think, everybody enjoyed a wonderful evening in Munich.